We're seeing some good prices on Baby/Toddler pouches with an additional 10% off (discount will show up at checkout). PLUS if you combine this offer with Subscribe & Save you'll score an additional 5% off PLUS free Shipping! Please keep in mind Subscribe & Save can be canceled at anytime (even after your first order ships) no obligations! 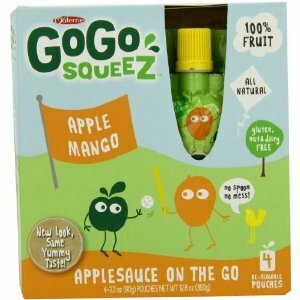 GoGo Squeez appleMANGO, Applesauce on the Go, 3.2-Ounce Pouches (Pack of 48) will be just $25.41 shipped after the combined discounts ($0.52 each). Happy Tot Organic Baby Food, Spinach, Mango and Pear, 4.22-Ounce Pouches (Pack of 16) will be $16.62 shipped after the combined discount ($1.03 each). See the complete selection of additional 10% off baby food pouches from Amazon here! Discount will show at final stage of checkout.